Managing to Make a Difference presents a leadership guide for those in the middle. The C-suite has a wealth of resources for leadership guidance, but middle managers face a quandary: often given little guidance on how to excel, they are also under enormous pressure to do a variety of things other than "lead." This book provides much-needed tools and techniques for building a high-performing team—without letting your other duties suffer. Organized around a coherent philosophy and based on solid research, the discussion offers a roadmap to engagement, talent development, and excellence in management. From difficult situations and organizational challenges to everyday motivation and inspiration, these techniques help middle managers achieve the goals of their organization while empowering their workers to achieve their own. Talent development is probably not your full-time job—yet it drives the engagement that results in high performance. This book shows you how to hit the "sweet spot" of middle management, with a host of tools and strategies to help you help your team shine. 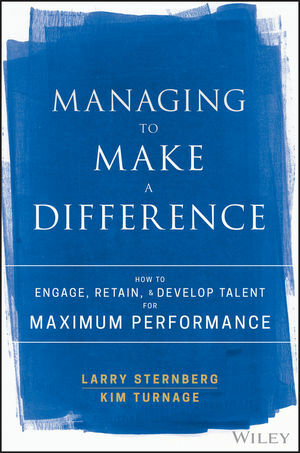 LARRY STERNBERG is a Talent Plus Fellow and on the Board of Directors. He has designed and conducted training programs on a variety of topics for thousands of executives and managers and has served as a facilitator for numerous organizations to articulate their mission, vision, and values. His areas of expertise include selection, training and development, employee engagement, empowerment, self-directed work teams, strength management, and leading change. KIM TURNAGE has spent her career figuring out where people naturally excel and connecting them with opportunities to stretch those talents. A natural teacher and coach, she works as a senior leadership consultant with Talent Plus, helping global client partners with the selection, development, retention, and succession planning of top leadership talent.